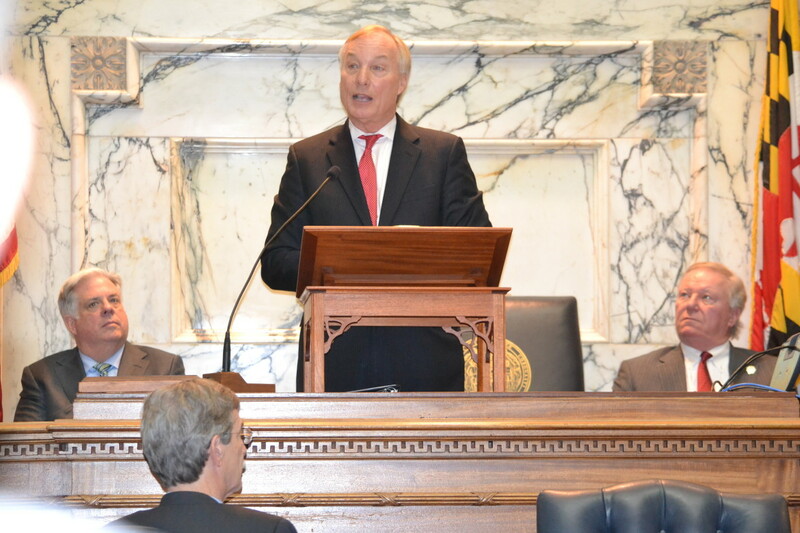 Above photo: Comptroller Peter Franchot speaks after being sworn in by Gov. Larry Hogan, left. Ocean City Mayor Rick Meehan, right, was master of ceremonies. At the Board of Public Works, Comptroller Peter Franchot has frequently complained about Maryland’s contracting process. At his swearing-in Monday, he made fixing the procurement process a priority he and Gov. Larry Hogan can accomplish without new legislation. Hogan will chair his first Board of Public Works meeting Wednesday flanked by Franchot and State Treasurer Nancy Kopp. Here is an excerpt from Franchot’s speech. We must make drastic improvements to the manner in which we obtain goods and services as a state. This cuts to the heart of what I do as your independent fiscal watchdog – ensuring that we’re getting the best possible deal for your hard-earned tax dollars. As Comptroller, I’ve voted on approximately 15,000 contracts worth $80 billion on the Board of Public Works. And I can tell you – our procurement process is broken. Far too often, I‘ve seen bid solicitations that result in single-bid contracts, and coincidentally or not, these single bids tend to be from incumbent vendors. So the Board of Public Works is forced to award contracts without ever knowing whether we, as a state, are getting the best deal on the market. Far too often, we’re presented with contracts that practically put a gun to our head, where we don’t have adequate time to fix procedural issues. And instead are faced with an unacceptable choice between agreeing to a bad deal for taxpayers or discontinuing a service they desperately need. Far too often, we’re asked to award short-term contract extensions, at an exorbitant cost to the taxpayers, simply because somebody forgot to initiate the process on time. And in far too many other instances, we’ve been asked to issue something called “retroactive approval.” The contract has already been awarded, tax dollars have already been spent, and work on the project has already begun. But of course, without the approval of the Board of Public Works. Let me be clear: “retroactive approval” isn’t approval at all. It’s nothing more than sanctioning a particular agency to end-run the Board of Public Works, and a process that’s specifically designed to ensure transparency and competition. This broken system does a profound disservice to our taxpayers because it prevents us from ensuring that public dollars are being spent appropriately and efficiently. And it does considerable harm to Maryland’s economy and business climate, because it leaves far too many on the outside looking in, believing that the rules of the game are rigged in favor of a few well-connected players. During the next several months and over the four years ahead, I‘ll be calling for a series of procurement reforms – that won’t cost the Maryland taxpayers a dime and that don’t require legislative action. But instead simply require a greater degree of commitment to transparency, competition and attentive management. Governor Hogan, I know you share my desire to fix our broken system and I look forward to working with you and your administration to achieve a procurement process that’s consistent, competitive and fair. All we need is the will to get it done.